This the journal entry for my quiet time of earlier today. I met God in Psalm 46. But Jerusalem doesn’t have a river, only springs. Clearly, the psalmist is speaking more figuratively when he says this. I think the takeaway for us today is this: Wherever God dwells and wherever God is welcomed, that place is holy, meaning set apart for God, God’s work, God’s purposes, God’s glory, God’s grace, and is glad. Revelation 22:1-3, says that in the heavenly city, where God the Father and the Lamb (Jesus) will dwell among their people, there will be a river, issuing from God, bringing life and peace to all who dwell with God. And, I don’t believe that it’s a stretch to say that this River has made more than a few appearances in our dying world. When Jesus died on a cross, a Roman soldier sought to confirm His death. And so: “...one of the soldiers pierced Jesus’ side with a spear, bringing a sudden flow of blood and water.” (John 19:34) Forming an inclusio within John’s gospel with the first act of Jesus’ public ministry according to John, turning water into wine at the wedding at Cana, we see that John’s entire gospel is informed by means of grace by which God comes to dwell with us in Christ, Holy Baptism and Holy Communion. In Holy Baptism, the living waters, the River--Jesus Himself, God incarnate--comes to live with us. 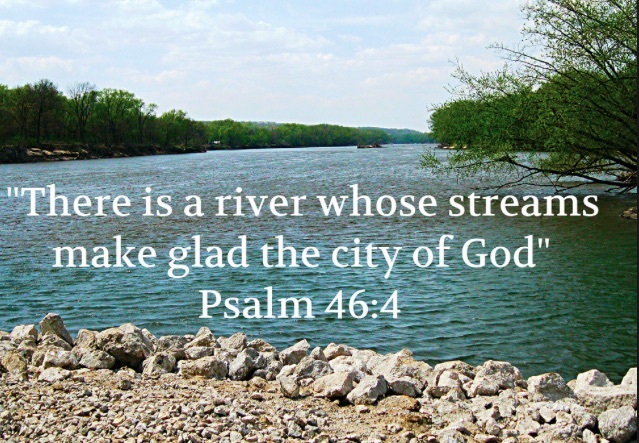 When we willingly, by faith, allow this River to flow into our lives, refusing to dam it off by our heedlessness toward God, we dwell with God. We live in glad fellowship with God. That person’s problems didn’t go away. But God made her glad because she had invited this God revealed in Christ to dwell with her, standing with her every day and refreshing her with His grace. 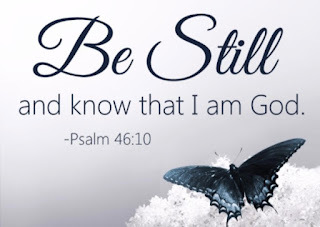 God still is God! And He can be our refuge and fortress! Respond: God, when I’m tempted to feel intimidated by the world or by my own fearfulness or by the fearful people who effectively deny that You dwell among Your people or who want to steal the joy I have in You, help me to remember that You are my fortress, my refuge, my strength, a very present help in times of trouble (Psalm 46:1, 11). And when I’m inclined to roam off on my own, chasing some wild hare rather than following You, call me back. Help me to be still and let You fill me with hope and gladness. And when I’ve become parched from living for myself and to myself, when I’ve forgotten that day to surrender to You, to seek forgiveness for my sins in the name of Jesus, to read Your Word, or to honor You as God, all while being stupidly mystified that things just aren’t right, call me back to You. Bellow at me, using other people, circumstances, and, most of all, Your Word and sacraments, to call me back to the River of life, to Jesus. Scream at me, God. as insistently as whistles, bagpipes, and trombones until, thick-header, thick-hearted, and sinful though I am, I hear Your insistent knock and welcome Your Son and His lordship and leadership over my life again...and again. And I can live in your peace, I can be still and revel in the assurance that not only are You God, but through Jesus, You are my God.